I have struggled with insomnia for a long long time. I'd read reviews suggesting this would help but I am a bit of a cynic. Plus the price put me off! I then had a sample on a magazine and had a fabulous nights sleep after using it! The heady mix feels both luxurious and relaxing. The bathroom still smells amazing the next day. Not a cheap product but there are 20 baths worth in a bottle. More importantly for me is the fact that this works!!! Even better it doesn't leave you with a hangover. I apply the oil to my body before I get in the bath- the scent then lingers all night. I will buy this again and again despite the price. Really love this product ! Really luxurious bath oil with great relaxing aromas. Also used the de stress range which is equally as good . I've been using this amazing bath oil for about 20 years. 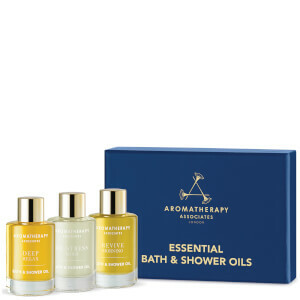 Aromatherapy Associates is the best brand of bath oils. I adore it! Best bath product I have ever used. The smell is divine and lingers on up to 2 days after in the bathroom. I just love this shower oil. A real touch of luxury. Lovely relaxing experience, fabulous scent. Be careful not to fall asleep in the bath! Bought this for my mum who sleeps badly. First tried the small versions and she was so enthousiastic that I bought the big bottle for her. It does seem to help her! Nothing more luxurious than coming home to a relaxing bath with this oil. It's truly relaxing!